$175 BILLION company to seek City of Austin tax incentives!!! Merck, the global pharmaceutical and health care firm, is considering Austin for a new technology center that could create up to 600 jobs and serve as a major anchor for the innovation district emerging around the Dell Medical School. According to city fillings made public this morning, Merck will request $856,000 from the city in performance-based incentives over a 10-year period. In exchange, the company would provide the new jobs, which pay an average annual salary of $84,586, the city’s economic development department said in a release. According to a draft economic development proposal, the company also would invest almost $29 million in facilities and equipment by 2023. Bottom Line: A new technology center as part of the innovation district at the Dell Medical school sounds like a lovely idea, one which Merck can pay for out of their $175 billion market cap without tapping out vulnerable taxpayers. #TXLEGE: Senate hearing bill to restrict LOCAL TAX carve outs tuesday!!! "Tax increment financing" is a particularly obnoxious form of subsidized 'redevelopment' that we've discussed previously (Note: The 2016 Austin Transportation bond was full of this nonsense). Essentially, they tax all property owners in a given jurisdiction, then give subsidies to politically favored developers for "blight removal." On top of that, local governments are essentially allowed to pursue these agreements in secret. This coming Tuesday, the Senate Natural Resources/Economic Development committee will hear SB 650 (Bettencourt), which would begin to reign-in this practice. Section 1 of the bill tightens the definition of the type of property that qualifies for this designation. Honestly, it's astonishing they didn't already do that. Bottom Line: Local governments pull this garbage all the time; while "tax increment financing" should be eliminated entirely, Senator Bettencourt's bill represents a significant step in the right direction. 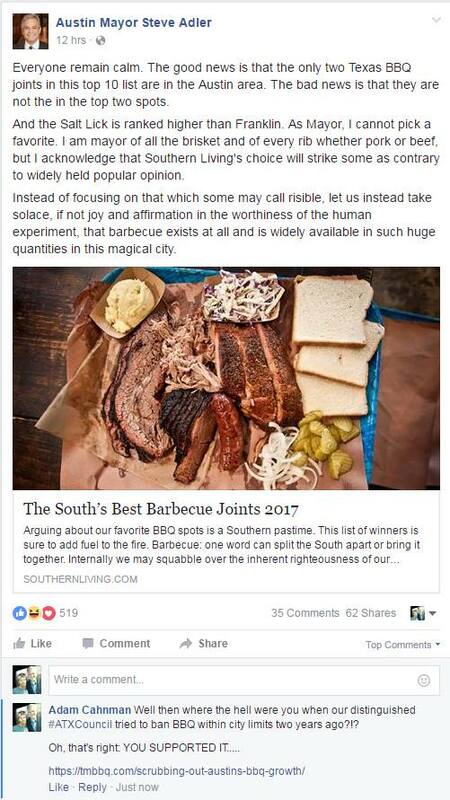 But, when council tried to ban BBQ less than two years ago, where was the mayor?!? Bottom Line: Can't make this stuff up. Bottom Line: The only purpose of this delay is to have the trial dominate headlines during the fall...right as campaign season kicks off. 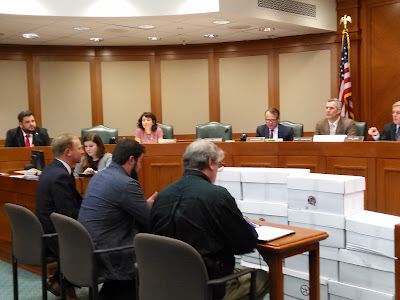 Remember, earlier this month, when Dan Huberty attempted to bury coverage of his plan to completely re-write one third of the state budget in the controversy of the privacy act?!? After weeks of debating how to prevent school districts from becoming financial losers, the House Public Education Committee voted 10-1 on Tuesday to adopt its leading school finance bill, which would inject an extra $1.6 billion into the state public education system. HB 21 is now eligible to be considered by the full House. The House Appropriations Committee is expected to pass its budget this week, with a full House vote likely next week. HB 21 would increase the base funding the state doles out to districts per student, in part by increasing funding the state gives to schools with bilingual and dyslexic students. Members voted on a substitute version of the bill, which more fully addresses how to tide over school districts losing money. This version does not yet have a fiscal note. Bottom Line: MOAR MONEY for socialized education; so popular we need to bury it behind controversial bills!!! But whoever walks wisely will be delivered." The (mildly) good news from this morning's Ways and Means committee agenda: They heard four bills related to eliminating the margins tax. To be certain, the Senate heard their version of this bill a month ago and voted it out of the full chamber last week. 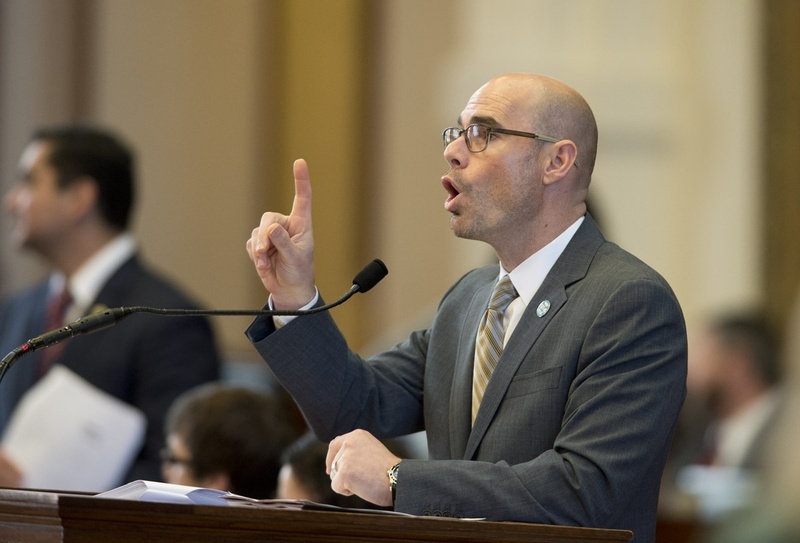 But still, Bonnen is hearing margins tax bills early enough for something to make it to the Governor's desk, and that's worth noting. Relating to the collection and use of municipal hotel occupancy taxes. Relating to the application of the sales and use tax to certain services involving real property. HB 1529 Lambert | et al. Relating to the application of and use of revenue from hotel occupancy taxes imposed by municipalities and counties. Relating to the franchise tax rate applicable to certain taxable entities that sell telephone prepaid calling cards. Relating to fixing the median cost of high-cost gas wells. Relating to miscellaneous gross receipts taxes on utility companies. HB 2690 Morrison, Geanie W.
Relating to the allocation of certain state hotel occupancy tax revenue. Relating to the exemption from ad valorem taxation of property owned by certain medical centers in certain counties. Lone Star Gun Rights/National Association for Gun Rights present constitutional carry petition. One of the weird dynamics of this session is that the House is actually pursuing much stronger gun bills than the Senate (Note: Yeah, you read that correctly). That dynamic was continued today. Jonathan Stickland's constitutional carry bill (HB 375) is currently being heard in the Public Safety Committee while the Civil Jurisprudence earlier heard several bills related to removing legal liability for businesses that permit legal carrying on their premises. During his gun layout, Stickland discussed how he's only filed four bills this session because of the attention he wants to devote to constitutional carry. He outlined the "dirty, racist," history of gun control laws. Furthermore, he pointed out that the CHL system represents a "barrier to entry" for law abiding citizens to engage in armed self defense. In response to Stickland's point about barriers to entry hurting low income citizens the most, the infamous Poncho Nevarez (yeah, that Poncho) proposed creating a bureaucratic workaround for the indigent. Of course, creating yet another bureaucratic process does nothing to address the underlying issue of government barriers to entry hurting the poor the most. Beyond that, Poncho's been engaging in lawyer semantics this entire hearing. On the legal liability bills, the civil jurisprudence committee heard several that would prohibit frivolous lawsuits against business owners that allow firearms on their premises. All of the bills would be a meaningful step forward. What we really need are the gun-free zone bills like the one under consideration in Florida, but the bills considered today are worth moving forward. Here's the thing: If we're Joe Straus, and we're going to kill the privacy act, then it makes a certain amount of sense to let constitutional carry through. He has to let something through and national trends are moving in a way that means he won't be able to kill it indefinitely. Furthermore, given the Senate's well documented discomfort with this issue, passing constitutional carry could be a really interesting way for Straus to put Patrick in an uncomfortable position. Bottom Line: These bills are in play. "And there are also many other things that Jesus did, which if they were written one by one, I suppose that even the world itself could not contain the books that would be written. Amen. This morning, the Senate State Affairs committee heard SB 445 (Burton), which would require political subdivisions to disclose the contracts they use to hire lobbyists at the Capitol. It would also require a public, recorded, vote of the relevant governing body before they could hire a lobbyist. Honestly, it's astonishing they weren't already required to do so. Taxpayer funded lobbying is a wicked and pernicious practice that should be banned entirely. It's anti-taxpayer. It's anti-property rights. And it's anti-School child. It enables a corrupt shell game that benefits all kinds of special interests at the local level. Thus, the bill considered today doesn't go nearly far enough, but it is constitute a meaningful step in the right direction. And sometimes, at the Capitol, you just need to accept that legislators are only comfortable going so far at any particular time; in the latter part of a session, you can't let the perfect be the enemy of the significantly better. We listed the Bible verse above because, in many ways, the metaphor of the world not being able to contain the books that could be written sums up our feelings about the evils of this practice. In preparing to testify, the challenge was how to sum it up in two minutes. Thus, we'll stick with the 50,000 foot overview. By holding this hearing, the Senate has already done more to address this issue than any legislature ever has before. This bill is significantly better than the status quo, and if this is where you can get 19 votes, then the legislature should pass it. But the practice needs to be banned entirely, and we will continue to advocate in that direction. HB 382 Murphy | et al. HB 595 Workman | et al. Relating to the use by certain tax-exempt organizations of certain payments made in connection with real property transfers to provide educational activities through certain schools. HB 1127 Raymond | et al. Relating to a franchise tax credit pilot program for taxable entities that employ certain apprentices. Relating to the prohibition of local motor fuel taxes on compressed natural gas and liquefied natural gas. Relating to the procedure for canceling a deferral or abatement of collection of ad valorem taxes on the residence homestead of an elderly person. Relating to the applicability of the sales and use tax to certain insurance services. Proposing a constitutional amendment authorizing the legislature to exempt from ad valorem taxation a portion of the assessed value of certain real property used to provide housing to certain individuals with disabilities. 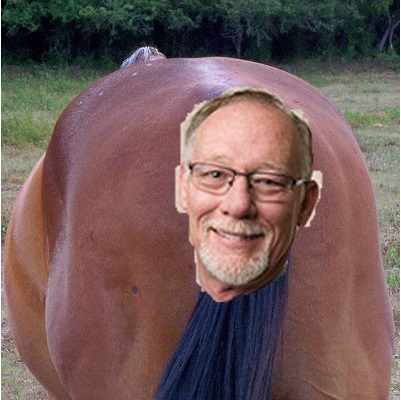 Jim Keffer is a former Straus lieutenant who retired in the face of a primary everybody knew he'd lose after the last legislative session. He also joined a left-wing think tank last October...on national coming out day!!! Likewise, the Texas Association of Business is an anti-innovation, anti-startup, pro-incumbent protection racket who we're made to look foolish in the Texas Senate two weeks ago. 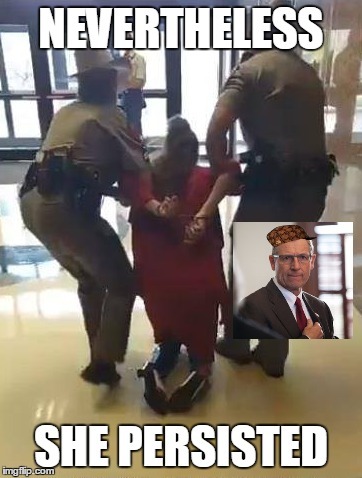 Fun Fact I: Keffer was also the bully who got busted hurling personal insults at a colleague last session. Fun Fact II: Jim Keffer was the original driving force behind the Texas "Ethics" Commissions's haf decade jihad against Empower Texans; speaking of Empower Texans, they have more here. Bottom Line: Truly, they deserve each other. 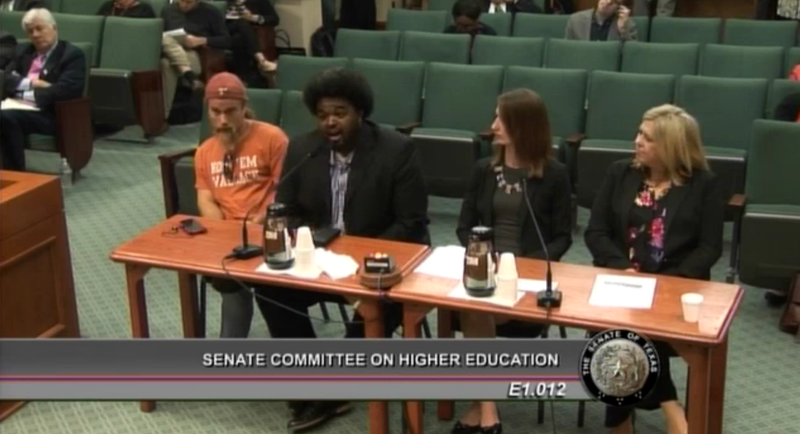 Tuition Day in Texas Senate's Higher Ed Committee!!! Yesterday morning, the Texas Senate's higher education committee heard five bills related to reigning in university tuition increases. The hearing was in an unusual format where all five bills were laid out then testimony was taken on all five. 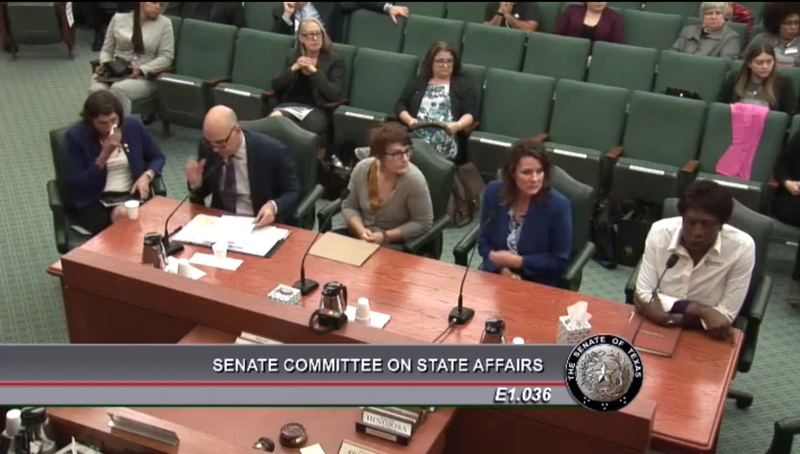 Due to misreading the Senate schedule (we thought the hearing began at 9 when it began at 8), we arrived late to the hearing, but we've watched the remainder of the hearing online and did make it in time to testify FOR SB 19 (Seliger) and SB 250 (Schwertner). Seliger's bill would impose a hard tuition freeze for four years, while Schwertner's would impose a long term cap on tuition at the rate of inflation. For the most part, testimony was the predictable litany of 'sky will fall' nonsense in the event public universities were required to show mild discipline in containing costs; lots of hysteria about "workforce" and "economic" development. Chancellor McRaven, however, used his testimony as an opportunity for chutzpah about the UT board being "conservative" with tuition hikes over the past half decade, considering that he came on board at the end of that time and one of his first acts as chancellor was to push a tuition hike. McRaven cited 2011 tuition data even though he was only hired in 2015. Also, for the record, Wallace Hall was on all of those boards 5 and 6 years ago. Beyond that, the Chancellor spoke in cliches about "being competitive," "excellence," and "investing in student success." The Chancellor did not refer to his military service at any time during testimony. As it relates to Senator Seliger's bill, we testified that colleges and universities love to build expensive buildings and hire lots of bureaucrats at six figure salaries and that forcing them to take a time out on tuition hikes would begin to curtail that process. [Note: It's also worth pointing out that it could be VERY hard for the House to kill (or Abbott to veto) a full tuition freeze...like it or not, suburban parents vote.] On Schwertner's bill, we testified that if Boards of Regents are going to continue defying the legislature then the time has come to begin removing various authorities from them. Finally, we urged the committee to take a very hard look at UTIMCO's $37 billion in assets as it debates higher ed. funding moving forward. Bottom Line: An encouraging hearing, we'll have to see what happens moving forward. Chairman Byron Cook: (512) 463-0730. Governor Greg Abbott: (512) 463-2000. See if you can spot the irony in this photo. "As opposed to the state having to take multiple rifle-shot approaches at overriding local regulations, I think a broad-based law by the state of Texas that says across the board, the state is going to pre-empt local regulations, is a superior approach," Abbott said Tuesday during a Q&A session hosted by the Texas Conservative Coalition Research Institute, an Austin-based think tank. Such an approach, Abbott added, "makes it more simple, more elegant, but more importantly, provides greater advance notice to businesses and to individuals that you’re going to have the certainty to run your lives." But then you start thinking about the current legislative session...and you realize that the bill filing deadline was 12 days ago. Then you consider that Abbott has been governor for two and a half years, during which time this issue has kept bubbling up in various forms, and you realize that he's never actually done anything about it. Note: In fairness to Abbott, he's also announced some worthwhile priorities (Ethics reform and the border stuff), but it doesn't changed the fact that he's put a bunch of crap seemingly less important issues in front of a systematic approach to local government accountability. 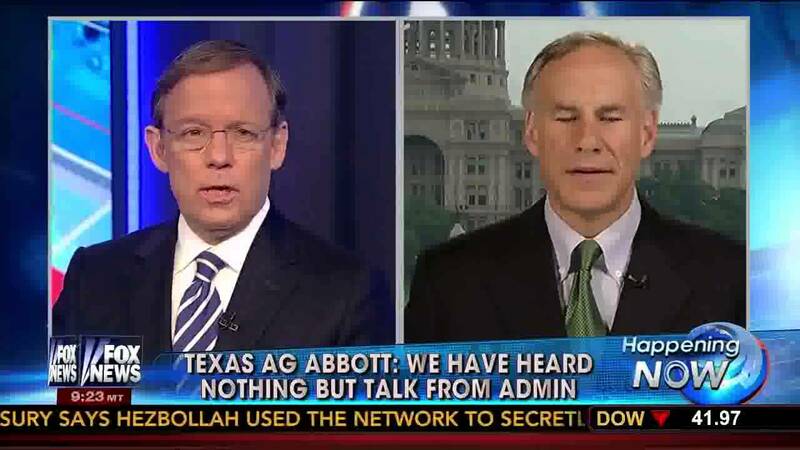 Of course, we would never accuse Greg Abbott of cynically making an inflammatory headline generating comment less than a year out from his re-election secure in the knowledge that the average voter won't realize it's too late for him to do anything about it...he would never do that! Bottom Line: At this point, when it comes to Governor FoxNews, actions speak SO much louder than words; if he wants to impress us, he should threaten a special session. There's a bill we've been keeping an eye on for several weeks about which we have yet to comment, but considering that it got a hearing this morning, now is a good time. SB 822 is a weird attempt to get the legislature involved in a West Austin land dispute that's been simmering for at least a decade. To be honest, we have no idea why the legislature chose to but in this session. While we have no specific knowledge, considering the neighborhood involved, we suspect there's a lobbyist who's also a participant in the land dispute. At the heart of the issue is a tract of land (sidenote: What else is new in Texas?!?) on which is currently situated the Lions Golf Course. The golf course is operated by the city of Austin while the land is owned by the University of Texas system. That being said, given its proximity to downtown and various other popular locations, this tract is a prime candidate for residential construction in a city that needs to build 150,000 units of new housing over the next decade. Because it's such a prime location for housing construction, from time to time UT has looked into selling (or long term ground leasing) the property to various developers...which of course doesn't sit well with the anti-growthers at the Austin Neighborhoods Council. This has led to the disingenuous and tiresome "Save Muny" campaign in West Austin. With UT's lease with the city set to expire in 2019, ANC is clearly trying to pre-empt a public discussion of the property. Which brings us to Estes' bill. SB 822 would transfer the property from the UT system (who might eventually allow hosing (in our city that needs to build 150,000 new units)) to the state of Texas' Parks and Wildlife department. The P&W department could be expected to keep the property as a municipally run golf course for the indefinite future. And, of course, keeping the property as a municipally run golf course will permanently remove almost a 150 acres of prime real estate from the housing stock. 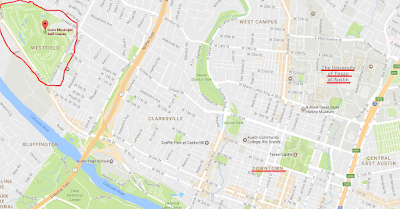 Bottom Line: For this website to come down on the same side as UT on an issue before the legislature should tell you a lot about the unusual nature of this situation, but leaving the status quo in place is the best possible outcome for everyone except a few vocal anti-growthers in West Austin. Note I: We didn't want to dilute the arguments on the merits above with an ideological tangent, but it's also worth pointing out that no city has any business running any golf course at any time. Note II: Where the heck are the Texas Exes on this one?!? For as much as they loved to play the "the legislature shouldn't micromanage universities" card during discussions of any attempts to hold Bill Powers accountable for all his misdeeds over the years, this actual attempt to micromanage the university's real estate doesn't seem to elicit a peep. They're the one group that could probably kill this thing if they got involved...so we hope they do. "I marvel that you are turning away so soon from Him who called you in the grace of Christ, to a different gospel,"
Note: To be fair, that one is coming next week, but it's still revealing that they heard minimum wage first. Any number of other measures related to local government accountability. Anything related to occupational licensing. Anything related to preventing university tuition increases. List [Your favorite issue] in the comment section below. Bottom Line: Yet, somehow, they've already managed to hear nine minimum wage bills. 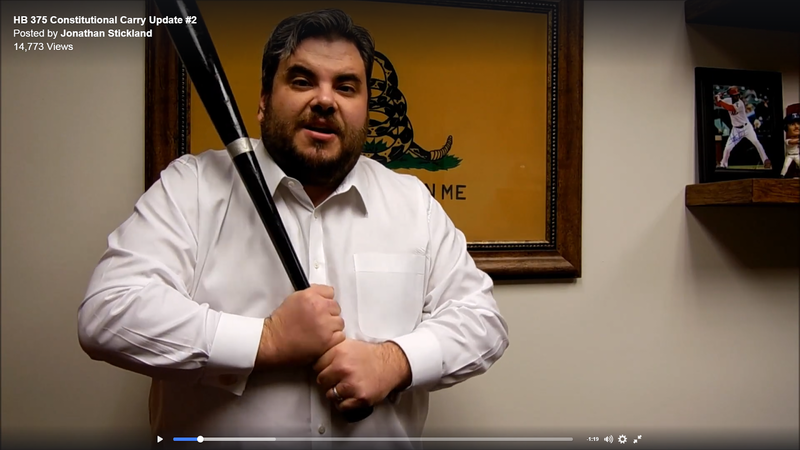 Stickland announces CONSTITUTIONAL CARRY HEARING!!! Straus' Priorities: Minimum Wage Hikes and Rainy Day Fund Raids!!! One of the interesting dynamics of this session is the degree to which House leadership is being open about their left wing priorities; this past week saw two humdingers. The institutions that we entrust with our future are facing serious setbacks that would harm our entire state. Our economic success begins in our schools, colleges and universities. In order to compete, we need a well-educated workforce with diverse skills. And the cuts would hardly be limited to education. Across Texas, state mental hospitals are crumbling. Without significant repairs, for example, the Rusk State Hospital in East Texas will remain a public health hazard. Nursing homes could be forced to reduce their staffs. And perhaps nobody should watch this debate closer than the retired teachers who put so many of us on the path to success. There is a $1 billion shortfall in the health care program for retired school employees. Without an injection of hundreds of millions of dollars to address that shortfall, retired teachers could face massive increases in their health insurance deductibles and very sizable increases in monthly premiums. Another idea is to combine spending reductions with a modest withdrawal from the state's Economic Stabilization Fund, also known as the rainy day fund. Read the whole thing here...but, honestly, what would you expect from a guy who uses identical language as Barack Obama to describe the economy?!? In a stunning move, the Texas House voted overwhelmingly to support Democrat efforts to hamstring the state’s economy by raising the minimum wage. Earlier today, State Rep. Hugh Shine (R–Belton) moved to suspend the rules and fast track a proposed constitutional amendment to raise the minimum wage by almost 50 percent. 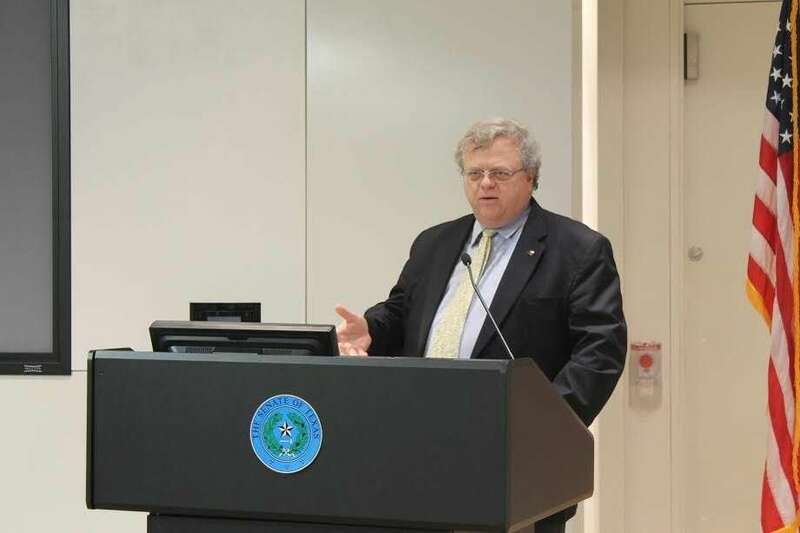 Authored by the chairman of the House Democrat caucus, State Rep. Chris Turner of Arlington’s HJR 56 would amend the Texas Constitution to raise the minimum wage in the State of Texas from the federally required $7.25 to $10.10 an hour. Loyal to the Democrat-coalition that governs the Texas House, Shine serves as the Vice Chair of the Committee on Business & Industry and likely made the motion at the behest of his committee chairman State Rep. René Oliveira (D–Brownsville). Despite the Texas Republican Party Platform’s call for a complete abolition of the minimum wage and a long history of free market rhetoric, Republican members voted overwhelmingly in favor of Shine’s motion, with only 21 members voting against the motion to suspend the rules. That vote was sharply condemned by conservative State Rep. Briscoe Cain (R–Deer Park) who is serving his first term in the Legislature after dispatching a liberal Republican. The minimum wage hike won't pass, but it will be used to waste time late in the session. And there will be nine minimum wage related bills getting hearings on Monday; in other words, whatever your legislative priority, nine minimum wage related bills are going to get hearings first. #TXLEGE: Zaffirini votes FOR Dismemberment Abortion Ban!!! Today, the Texas Senate passed Senate Bill 415, the Dismemberment Abortion Ban, on second reading. The bill was preliminarily approved by the Senate on a bipartisan 22-8 vote. In addition to every Republican of the Senate supporting the measure, two Democrats – Senators Eddie Lucio Jr. (D-Brownsville) and Judith Zaffirini (D-Laredo) – voted for the life-saving measure. Senate Bill 415 and House Bill 844, the Dismemberment Abortion Ban, outlaw the barbaric and inhumane procedure that ends the life of a living, conscious preborn child by tearing her limb from limb. Bottom Line: It's not often we say this, but as a constituent of Judy Zaffirini's we commend her. 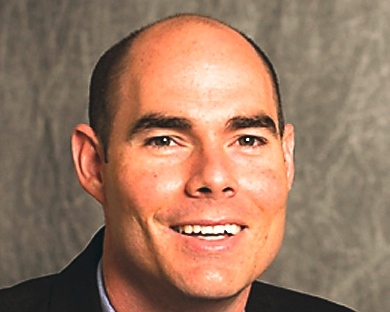 It's that time of week when we check on the latest from Dennis Bonnen and the Texas House Ways and Means committee. Yesterday, the Texas Senate took a tangible step towards meaningful property tax reform (even if it doesn't go far enough). How did the House follow up today?!? HB 170 Lucio III | et al. Relating to exempting books purchased, used, or consumed by university and college students from the sales and use tax for limited periods. HB 242 Hernandez | et al. Relating to the motor vehicle sales tax imposed on the purchase, rental, or use of certain emergency services vehicles. Relating to the sale or assignment of tax credits for the certified rehabilitation of certified historic structures. HB 1332 Parker | et al. Relating to the exemption of certain entities that operate ambulances from certain motor fuel taxes. We've never seen a day when this many issues related to local government accountability were heard in a day; this is new. In terms of obvious storms on the macroeconomic horizion, the property tax system in Texas (alongside local government debt) is the equivalent of the national debt in term of predictable problems on the short to medium term horizon. Texans currently pay the highest property taxes of any state without an income tax. This is a high priority mess that needs to be addressed before it bites us in the backside. On the TNC issue, Don Huffines' bill (SB 113) is the only bill up today that will pre-empt the next round of regulatory challenges related to ground transportation and new technology. That's why we testified in favor of it. Nevertheless, we can count votes and Charles Schwertner's bill represents a significant step forward from the status quo. Additionally, the property tax system as it currently exists is the mother's milk that feeds all sorts of other corruption in the legislature. As we have previously discussed; Senator Bettencourt confessed to several good reasons why SB 2 (the property tax relief bill) doesn't go nearly far enough. Under questioning from other Senators, he repeatedly admitted that the bill does not amount to a revenue cap, and he also admits local jurisdictions will still be able to raise taxes close to 10% without an election. Nevertheless, this is a significant step in the right direction and see our previous comment about counting votes. Bettencourt's bill would rename the effective tax rate the "no new taxes" rate; this can only simplify things for the average taxpayer. 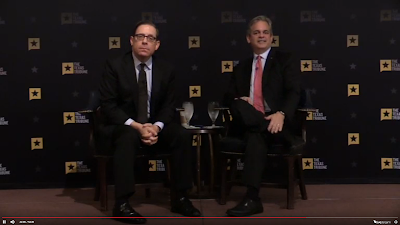 Bettencourt -- Taxpayers in Harris county often pay 10 taxing jurisdictions at a time. Bettencourt too frequently talks in policy wonk language and goes over people's heads. Actually, Bettencourt straight up talks too much. Paul Bettencourt: We love you, and we agree with you, but shut up. 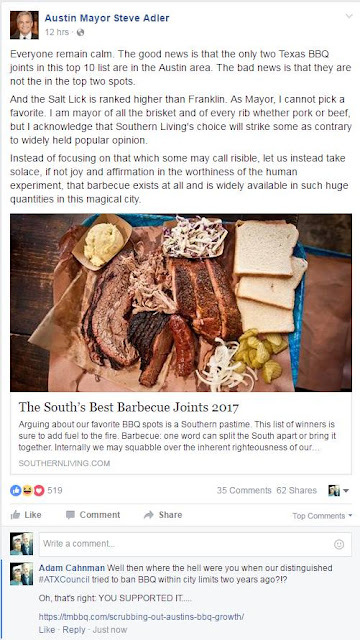 Ann Kitchen plugs "new" Austin TNC's while ignoring last Saturday's meltdown. #TROXROX -- Texas less desirable place to invest because of Austin Ridesharing debacle. "Local control is only valuable as a tool to protect individual liberty." Schwertner: Restricting mobility options is just wrong. Kelly Hancock goes full trial lawyer on Ann Kitchen. Committee took the black market that emerged in Austin after council kicked out Uber and Lyft to the cleaners. Samsung's largest physical plant in the world is located in NE Austin. Even with the incentives they receive, Texas' property tax system still isn't competitive. Note: That's quite a remarkable statement coming from a big business. Whitmire goes full Elizabeth Warren. #TROXROX -- Rates should go down as appraisals go up. Austin had an additional $50 million to spend last year even at "no new taxes" rate. SB 2: "A critical tool that must be adopted." First thing to cut would be new vehicles every three years. Voted against bailing out library. Kel Seliger tried to throw her under the bus and she threw it back. No reason you can't hold cities and counties accountable alongside school districts. #TROXROX: Several activists from outside the local area who'd never seen Ellen Troxclair in action before spoke positively about the degree to which she refuses to take crap (especially re: the exchange with Seliger). They laid out but have yet to take testimony on the short term rental bill, but the short version is as follows: the degree to which the Austin anti-STR ordinance creates new police powers out of thin air is creepy. 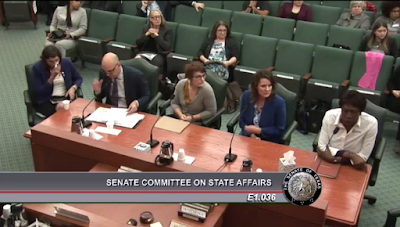 Bottom Line: We'll include links to testimony and deeper thoughts at a later time, but the short version is that after decades of atrophy the Texas Senate is beginning to rehab their constitutional muscles as it relates to local government accountability. Hancock: Did your [TAB's] board see this legislation before or after TAB took a position?!? TAB dodges question: Our board took a position back in September. Hancock: Did you take a position before or after this legislation was filed?!? Hancock: So you took a position without reading anything?!? Hancock: Do you often take positions on legislation without reading it?!? TAB: Something, something "Yes, actually, every September prior to every legislative session...."
Author's Note: You can't start pre-filing legislation prior to mid-November. Hancock: So the legislation itself doesn't matter?!? Hancock: Can you tell me what the GDP of Texas is?!? TAB: "I don't know off the top of my head." Hancock: "Oh, come on, you're TAB...give it a wild guess Chris [Wallace]." TAB: "I don't know the exact number." Hancock: "Do you want me to google it for you?!?" Hancock: "You're claiming you speak on behalf of the businesses of Texas, surely you know ballpart what the GDP is." Hancock: "Can you divide [$85 billion] by [$1.4 trillion] and...tell me what it gets you?!?" Bettencourt: "The right number is $1.7 [trillion]...but go ahead." Hancock: "Dude, if I'm representing businesses, I hope my math skills would be better." TAB: "One half of one percent." TAB reverts to talking points; something, something "keep Texas open for business." Bettencourt: "Did you read this study before you quoted from it on December the sixth of 2016...did your board read and approve this study for use?!?" TAB: "The board was never asked to approve this study..."
Bettencourt: First two 'laws' you cite weren't actually passed in their respective states. 2017 #TXLEGE Tesla Bills look MUCH Stronger!!! We read the bill here, and we can't find anything to dislike; read the full Trib piece here. Bottom Line: Sometimes, when you have to wait a session or two you just end up with a stronger final product (Note: Something similar might be in the process over parental educational choice). It might not be necessary, or right, but it's also reality as long as the roster looks the way it does. This might be one of those cases. Did Charlie Geren just do something...good?!? The article goes on to detail objections from Google, who believe Geren's bill might slow the development of autonomous vehicles. Then, of course, there's the fact that this is coming from Geren. So trust is, putting it mildly, minimal. So we decided to read the bill. It's a simple, two page, bill that's not written in lawyer language. Soo...it seems like a good start. (c) A political subdivision of this state may not impose a local fee, registration requirement, franchise, or other regulation related to an automated motor vehicle or automated driving system. In other words, Geren is pre-empting another shakedown from the Austin City Council "burdensome over-regulation" at the local level. Some might object to the $10 million insurance requirement, and any insurance mandate would be less than 100% free market. But, realistically speaking, it's difficult to see how a bill like this could pass without some form of insurance requirement. All things considered, it's a surmountable hurdle. Bottom Line: If it stays close to its current form (admittedly a big if) then Charlie Geren's autonomous vehicle bill seems like a meaningful step forward. Read the full Trib article here; read the bill here. They continually gather together for war." Article II of the state budget appropriates state funds for various health divisions (i.e. the Department of Aging and Disability Services, Department of Family and Protective Services, Department of State Health Services, and the Health and Human Services Commission). From these funding streams, Texas Right to Life was able to identify and remove $62 million from abortion organizations, adopt strict funding rules, and increase funding to the Alternatives to Abortion program. 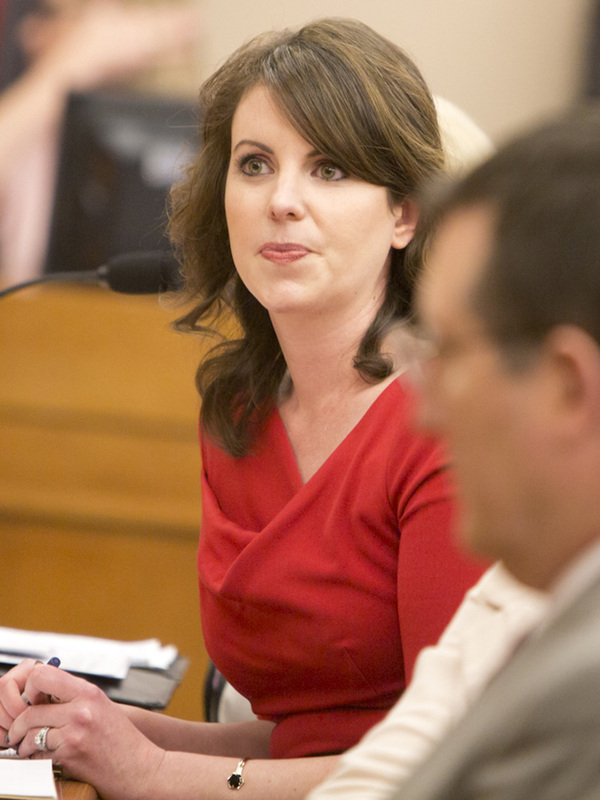 This legislative session, Pro-Life Texans must be even more diligent in watching potential funding of the abortion industry due to the person tapped to chair the House Appropriations Subcommittee on Article II, State Representative Sarah Davis (R-West University Place). 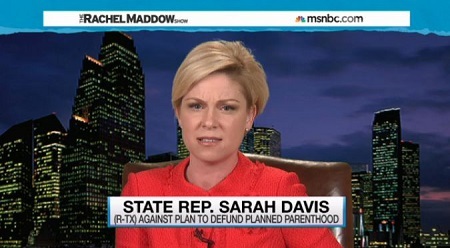 Davis is the only Republican who is openly anti-Life and endorsed by Planned Parenthood. Appointed to chair the subcommittee on Article II by Speaker Joe Straus, not only does Representative Davis have an abysmal record on Pro-Life issues, she also scores poorly on all fiscal indexes. In fact, last Session Davis passed an amendment in the same subcommittee to undo Pro-Life language the Senate had written to ensure that Planned Parenthood did not receive state funding through the Breast and Cervical Cancer Screening Program. Such a record clearly indicates she is not the best Republican, out of 94 Republican members, to be chairing a committee tasked with overseeing Texas tax dollars. 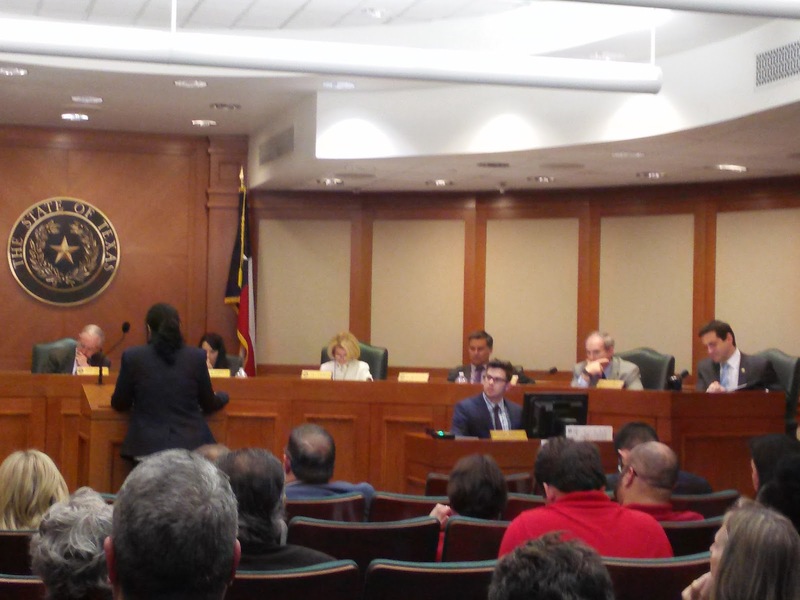 Last week’s meeting in the Article II subcommittee showed a glimpse into Davis’ intent to secure funding for additional pet projects undermining the Pro-Life values of Texans. After testimony from a doctor praised the family planning program in Texas, Rep. Davis asked the witness about an exaggerated study attempting to blame Texas’ maternal mortality and morbidity rate (MMR) on the state’s efforts to stop state funds from going to Planned Parenthood. The study and Representative Davis’ position, seek to correlate decreased taxpayer funding of Planned Parenthood to the study’s alleged maternal death rate. The MMR study has been shown to be flawed in many aspects, including failing to take into account that states and countries throughout the world do not have a standard reporting apparatus. The MMR study also failed to parse how many maternal deaths, defined as death within one year of giving birth, were attributed to heart disease, drug use, and hypertension – the three leading causes of death for Texas women. However, such facts do not fit neatly into the abortion left’s deceptive talking points. Davis’ interest and reliance on such a misplaced “study” further shows Texans she is bent on restoring taxpayer funding of the abortion industry in Texas. It was bad enough that Straus appointed a pro-Obamacare spendaholic to chair the Appropriations committee; now that same spendaholic (whose own commitment to life is questionable at best) appoints the only Republican endorsed by Planned Parenthood to oversee the subcommittee that oversees Planned Parenthood's state funding (and no, the State of Texas has not defunded them). The patient in spirit is better than the proud in spirit." Confession: Given his recent support for Ellen Troxclair's "affordability road map," Mayor Adler is on our good side at the moment. That being said, we asked him about a recent report about the implementation of the 2016 transportation bond at this morning's trib event. Our question begins at the 42:00 minute mark of the video. On a separate note, we thought this was the best performance we've seen from Evan Smith in awhile; he hammered the Mayor on ridesharing and short rentals. Gives company line on Uber/Lyft. Same old discredited spin about fingerprinting in NYC and Houston. New companies "don't have the same reach." Government and companies "need to work together." Author's Note: What could POSSIBLY go wrong?!? Claims innovative companies want to be here because of council policies. Council policies = "Spirit and soul" of community. Same tiresome "local control" argument we hear over and over again. Long discussion of privacy act. "Created by God just the way you are." Author's Note: No mayor, you're not good "just the way you are." Everyone falls short "just the way you are"...that's the whole point of the cross!!! Don't make us do another theology lesson during citizen's communication. Long discussion of school finance. Long discussion of sanctuary cities. "City will follow the law" if it passes lege. Gives company line on 2016 transportation bond. Dodges question re: potential 2018 transportation bond. 2016 bond implementation will be most transparent implementation ever. Author's Note I: We shall see. Author's Note II: If they want to come back with another ask in November 2018, they better have something tangible to show for what they already got by June of that year. Gives company line on Short Term Rentals. Evan calls BS on distinction between short and long term rentals. CodeNext: Need more people living along corridors. Need other population centers besides downtown. Author's Note: See his 97% quote here. McRaven cries UNCLE over Houston Land Grab!! !